Unlike granite and brick, travertine pavers aren’t as popular but are very practical paving options. Travertine is an extremely durable material just like granite. One of the most famous lasting structures, the Colosseum of the ancient Roman Empire is made mostly of travertine. Its timelessness also features its ability to retain its color even when exposed to harsh conditions and constant weather changes. 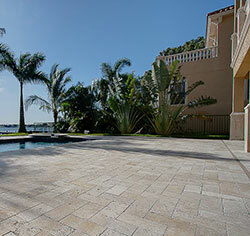 Travertine pavers are also perfect to be used for areas where aesthetic appearance is an important consideration. These travertine pavers are available in a myriad of interesting patterns for different people’s fancies. There are the usual patterns like the French, mosaic, basket weave, rattan, herringbone, star, diamond cut. But there are constantly new design pattern releases that are refreshing as they are exciting. The colors also come in a very wide range. There are the more common paver colors like peach or pink, red, yellow, ivory, gold, beige, walnut and other shades of browns. But new manufacturing techniques provide newer available colors that can match and complement various color schemes of a paving project. There are also different finishes for the various different uses a project may have had for it. These often include antique, tumbled and honed. The choices for travertine pavers can accommodate even the creative and ambitious design and plans. It is a great material for border, providing great accent effects. There are travertine designs that are perfect for these borders: art deco, scroll, wicker, shells, wrought iron, gothic, stars, rope and other options are available. The design options are grouped under themes that can help you choose the best travertine pavers for your project. Personalized paving projects will definitely benefit from these many choices. It is best to take advantage of this design freedom considering the longevity of the paving material. It is also notable that travertine is a very low-maintenance material, which is also costs less than the other popular paving material choices. The colors are all natural and there is no need for solutions to treat its surface. So its beauty lasts as long as the tiles themselves, and these things lasts for many years. It is available in many sizes that are considerably easier to install. Pieces can be cut into desired shape and sizes when preferred. It doesn’t crack like brick pavers because travertine does not expand, thus it is perfect for any weather. Easy on the money and practical on the time, travertine pavers have great value as you make your project even more beautiful.